From 1 July 2019, you can choose your CTP Insurer from four Government-approved insurers. CTP Insurers can compete on price and service. Currently, your insurer is randomly allocated for you when you register your motor vehicle. 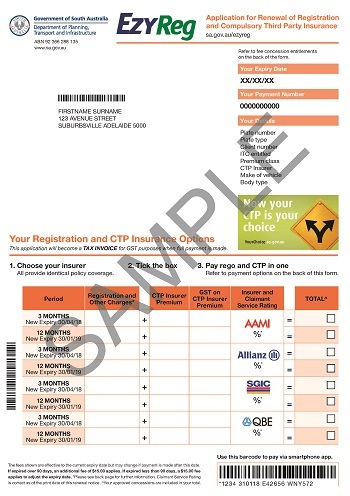 For registration renewals due on or after 1 July 2019, you will choose your CTP Insurer from the four Government-approved CTP Insurers listed on your registration renewal notice. With identical policy coverage, you will choose based on premium price and how people who have made an injury claim rate the insurer’s service. To set the conditions for CTP insurers to compete on price and give choice to motor vehicle owners, the Government introduced a market-based CTP insurance model. During a three year transition period from 1 July 2016 to 30 June 2019, four Government-approved CTP Insurers have been offering the same CTP insurance product (the compulsory Policy of Insurance) at the same price. From 1 July 2019 the insurers will continue to offer the same product, but can compete on price and service. keep CTP premiums fair and equitable for motor vehicle owners. worked closely with the Department of Planning, Transport and Infrastructure and Service SA in the development of tools and information to support motorists. When you receive your registration renewal notice, there will be an updated section on your form with pricing and a Claimant Service Rating for each insurer to allow you to compare. In this section, you will choose from one of the four CTP Insurers by ticking the box for your chosen period of registration next to the insurer’s name. Once you have chosen your insurer and ticked the box, you pay for your registration and CTP insurance in one easy transaction. Each insurer’s policy coverage is identical and set by the Government, so you will choose from the four CTP Insurers listed on your registration renewal notice based on premium price and Claimant Service Rating (a measurement of how people who have made a claim rate the insurer’s service). ​Learn more about renewing your CTP insurance and watch the video below for more information about choosing your CTP Insurer when you renew from 1 July 2019.